Spring is almost upon us — and with it, comes tornado season. Are you prepared? Is your family? How about your home? Tornadoes can cost homeowners huge sums of money in losses. And even worse, they cause dozens of human casualties each year. If there’s anything we can take away from the tornado tragedy in Bauregard, Alabama earlier this month, it’s that the best time to prepare for a tornado was yesterday. You are always better to be better safe than sorry. Here at ServiceMaster Restoration by Simons, our number one priority has always been to help homeowners prepare themselves for the unthinkable. Our experts have lived through many tornado seasons and helped clean up the aftermath. We’ve seen just how destructive tornadoes can be, and we understand the biggest challenges homeowners, residents and victims face in their immediate aftermath. Of course, keeping hydrated is the most important thing you can do for your body in the event of a disaster. That’s a no-brainer. But what people forget to plan out is where that water will come from. If water lines are down or contaminated, or pipes are broken, or the power goes out, you won’t have access to your tap water. Make sure you keep some bottled water or a few gallons of water in an allocated shelter space in case you are stranded after a tornado. You never know how long you may have to wait. In addition to water, stock up on non-perishable food items that will keep stomachs full – especially those of young children. Keep an eye on the expiration dates and replenish your supply as needed. We recommend having at least 5 days worth of food on hand for all members of the household. Keep a portable radio with extra spare batteries near your designated shelter space. In a weather event like a tornado, you can use it to listen for any updates or changes to the expected trajectory of the storm. We cannot stress how much of a difference a well-stocked first-aid kit can make after an emergency, especially one that is from a survival company. You never know what injuries, minor or major, will occur during a storm. Not many people think of this one before the storm hits which can cause a huge problem for those taking life-sustaining medication. Have extra amounts of any necessary prescription medications stored away for use during an emergency. Keep a few bottles of cold medication, over-the-counter pain medication and allergy meds on hand too. You probably don’t have to take our word for it that in the event of an emergency, you are going to want a fully-charged cell phone so you can stay in contact with family, friends and emergency personnel. If possible, keep a backup phone and a portable, solar-powered charger ready to go in case the power goes out. Of all the items we’ve listed, this is probably one of the most important. 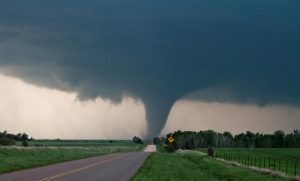 Because there is never any certainty when it comes to tornadoes and other storms, you should keep copies of birth certificates, social security cards, house deeds, insurance cards, passports, and other important documents packed in a safe place that you can easily transport with you to your secure shelter. Here at ServiceMaster Restoration by Simons, we know weather emergencies like the backs of our hands. We pride ourselves on our emergency restoration services and storm damage restoration expertise. We will help you begin rebuilding so you can move forward after a life-uprooting natural disaster. Our experts are standing by to serve you — give us a call today for a free quote. ServiceMaster Restoration By Simons is a MBE/WBE certified firm and family-run company serving Chicago, Oak Park, River Forest, and the North Shore. Recently, the company was awarded a variety of honors, including the ServiceMaster Achiever Award and outstanding service in disaster restoration by Build Magazine. ServiceMaster Restoration By Simons provides disaster restoration services including Water & Flood Damage Restoration, Fire & Smoke Damage Restoration, Mold Remediation and a wide range of interior specialty cleaning including Hoarder & Clutter Cleaning, Post-Construction Cleaning, Carpet Cleaning and Upholstery Cleaning to residential and commercial customers residing in Chicago, Oak Park-River Forest and the North Shore. For more information, give us a call at 773-376-1110 or visit servicemasterbysimons.com.